Upgrading to network-based DNC cut production overtime from 523 hours per week to 120 hours, a 77% reduction. IMC Magnetics (Tempe, AZ), a subsidiary of the Minebea Group, is a recognized leader in the design, development, and manufacture of quality solenoids. For more than 40 years, IMC has built its reputation serving aerospace and military avionics. As with most companies, the need to improve efficiency, speed, and quality are of the utmost importance. In those regards, IMC discovered three major problems: 523 hours of overtime per week; lengthy product backlogs; and increased numbers of scrapped parts. In an effort to make their manufacturing more efficient through standardized production, IMC needed to take two important steps: change tooling, and improve DNC (direct or distributed numerical control) communication with controlled standardization of files. IMC decided that a standardized DNC communication system should be the first step. Richard Nichols, IMC’s manufacturing team leader, describes his former DNC communications as a laptop with a DOS program that he moved around the shop. Nichols noted that there was no standardization in NC files, resulting in a lack of consistent information in the shop. For example, when an operator called in sick, some parts just could not be produced on certain machines because of the reliance on specific parts information known only to that operator. Another problem was that there were multiple NC files that contained similar information with the same file number and name. Nichols says, “We had no way of controlling this problem since everyone had access to the laptop and all the files contained on it. We could pull up as many as 20 NC files with the same name. The IMC engineering group had no way of determining the correct file. The night shift would run the program one way, and the day shift would apply a different technique. Nichols became convinced more than ever that a DNC communications system was absolutely necessary. As a result, IMC called in the top DNC communications companies to demonstrate their software and provide bids. Their features were evaluated, such as: compare files, remote request, user management, user rights, and tool management. With the installation of eXtremeDNC and standardization, true control over the NC files was achieved for the first time at IMC, according to Nichols. “Although we have to determine which files are valid, most of this process is automated through eXtremeDNC’s Auto-Tagging and Auto-Naming filing features,” he notes. These combined features automatically scan and rename an NC file, according to the inserted information found within that specific file. Although the 77% reduction in weekly overtime was very impressive, IMC is confident that there is room for further improvement. Nichols spoke to Tim Carson at Ascendant Technologies, and Carson recommended using bar code scanners and integrating offsets and tool presetters into eXtremeDNC. To improve IMC’s manufacturing even more, an advanced feature was installed that enables IMC to set up the entire cell at one time, including materials, heads, offsets, SPC (statistical process control), and presetter. 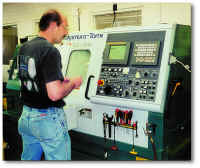 Files are sent in a DNC format to overcome the limited memory of the machine tool’s control. In reality, a bidirectional communications line is established during file loading. (eXtremeDNC is believed to be the only software system that is capable of this.) The bidirectional communications line enables SPC data to be received during DNC. 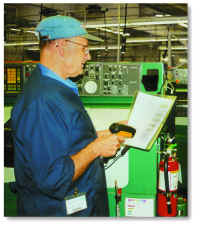 This allows IMC to modify programs on the fly in order to fit the needs of the parts with respect to materials. The DNC system is expected to pay for itself within the first two months of its operation. After that time, it will continue to help increase production, efficiency, and profits. “If you don’t move with new technology, your shop will be left behind,” Nichols adds. “Those who are most efficient and cost effective, and are able to deliver the products to the market quicker will be winners.” Ascendant Technologies, Inc.